Zimbra provides open source email and calendar groupware software, with a browser-based AJAX client to deliver a rich experience with a message conversation view and visual search builder that makes multi-gigabyte inboxes easier to use. They also integrate 3rd party applications as “mash-ups” via web services so you can view CRM data, maps, or anything else without leaving the context of a message. Xuheki is a fast IMAP client which has a browser-based AJAX client so you can access it from anywhere to read your email. It has most features that you would expect from a fine “Mail User Agent”. Xuheki is distributed under the terms of the GNU General Public License. AtMail, a free lightweight Ajax Webmail client software that is written in PHP that allow end user receive email via web browser and WAP devices. This webmail client software can be installed on variety platform like Windows and Linux. Plus more, it support various email technology like IMAP/POP3 mailboxes, and an optional email-server mode that uses Exim as the MTA. AfterLogic WebMail Lite PHP is easy-to-use webmail script with modern interface, supports AJAX and skins. 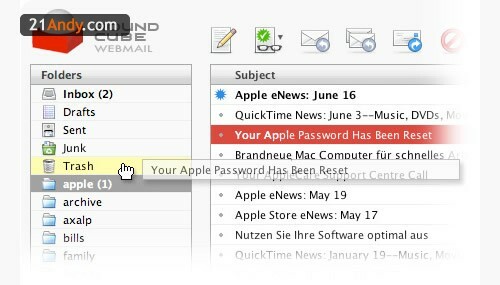 Users can receive, view, delete, compose, and send mail through web interface (POP3 and SMTP supported). Multiple attachments, multiple mail accounts and domains, preview panel, web-based administration. Easy installation, supports PHP 4.1 and above. Open source and completely free. Can be upgraded to Pro version with extended features…. Hastymail is a full featured IMAP/SMTP client written in PHP. Compatible with PDAs, phones, text browsers, and with all mainstream browsers. Hastymail has a powerful plugin system that PHP developers can use to alter the way it works. Plugins can add pages within the Hastymail application (including css files), alter existing pages by inserting XHTML, modify internal data structures within Hastymail, make AJAX callbacks using their AJAX system, and even communicate with a configured SQL server. Mailr is an open source webmail application written in Ruby which uses Ruby On Rails web application framework. The application is tested with Courier-IMAP but it should be possible to use it with any other IMAP server. Claros inTouch is an Ajax communication suite with key features such as webmail, address book, post-it notes, calendar (in progress), webdisk (in progress), built-in instant messenger and rss reader. It is the first open source web application which features built in spam protection and instant messaging capabilities together with web 2.0 technologies. Built with Java, utilizes JSP/Servlets with the well known J2EE technologies & uses MySQL database.